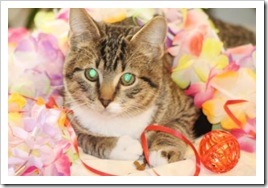 Java is a handsome brown tabby with white tuxedo markings. He is adorable. Java is just five months of age in these photos. He weighs about five and a half pounds. 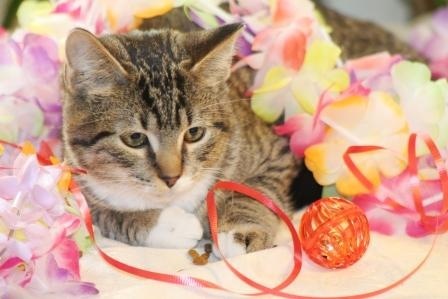 He enjoys spending his days with his sisters, Ashlee and Dusky as well as another kitten Cafecito. Java is very friendly and affectionate. 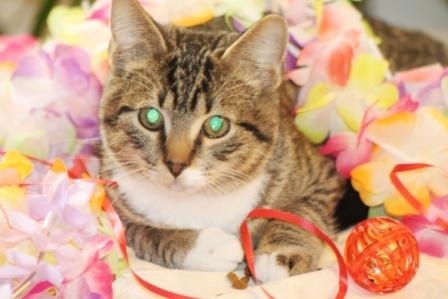 He is also playful, adapts well to new situations and is simply a well balanced kitty. His sister Ashlee is a lovely all black kitten and his sister Dusky is a brown tabby. Cafecito is also a brown tabby. If you are looking for a pair any two of these kittens would provide a life time of enjoyment and pleasure. They are all really sweet. Java is available for adoption. If you are interested, please fill out an application and email it to us as an attachment. Medical: Java is neutered, wormed, and up to date on shots. 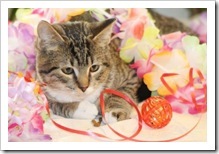 He has been tested for Feline Leukemia and has Revolution applied once a month. 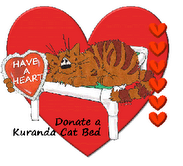 We will micro chip cats and kittens adopted from our program who are over five pounds for an additional $10. This fee includes a $20 prepaid registration form so you can register your pet into your name. PetsConnect has moved to a no-declaw policy. This means adopters will be asked to not declaw any kittens or cats adopted from the PetsConnect program. Most of our kittens and cats have Soft Claws (nail caps for cats) on their front paws.